For our tests, we created a demo for each grid that initializes a grid on a page with different number of rows and columns. If you want to make sure that the results are objective and check the loading speed by yourself, download the demo here. At first, we set up a demo of each grid that has 10 columns and different number of rows (from 100 to 10,000). 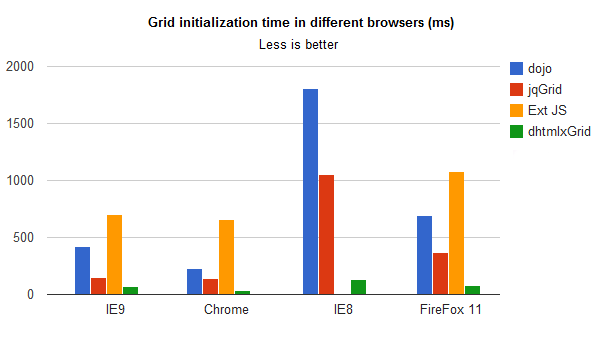 We tested the grids in IE9 and the latest Google Chrome. The charts below show the time of initialization of the grid on a page in dependence to the number of rows. According to the tests, dhtmlxGrid has the shortest loading time and loads on the page faster than others. 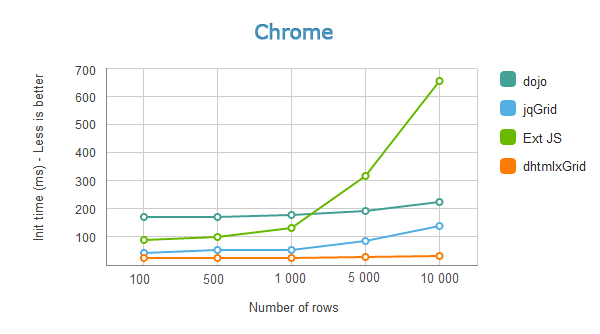 While the number of rows increases, the difference in the loading time becomes more visible. This is a less popular scenario but we also tested the grids with large number of columns (the number of rows stays the same – 1,000). The charts display initialization time of each grid in dependence to the number of columns. Not all grids have stood the test with 1,000 columns. Ext JS grid has failed to load the data and others showed a significant increase of initialization time (that’s why we didn’t include the results for 1,000 columns in the charts). With which version of ExtJS was this tested? Should use Ext JS 4.1 RC2 instead, grid speed is a lot better. Use an RC2 product to do a speed comparison? That would only be helpful if you suggest people start using RC2 in their live production sites. Well, why not? Traditionally the last RC in any release cycle should be a mature version and only minor issues left. Afaik RC2 is the last RC before 4.1GA. 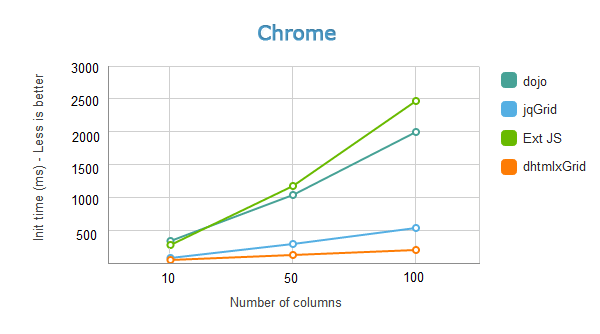 Czeslaw, we might add the results in FF, but I can’t agree that FF is now more popular than Chrome. Please check these links: Top 5 browsers from Feb 20 to March 20 and Usage share of web browsers (from Wikipedia). I have used Dojo in few moths. Not only the grid, the UI components are also heavy. It renders a lots of elements even for a simple check box. I have tried with extjs 4.1 but is slowly than 4.0 …. there is no one that load 10000 and more rows in a table …. and without pagination!!! Do the right test using json proxy for loading data and then republish the results! I suggest doing tests on empty grids :) – will be much faster! Giulio, I don’t know why, but according to my expirience in most cases customers don’t want pages – just scrolling. And 10k rows is not the limit, btw… Although I agree this is not good for UI. But this is real life. Thanks by the info, i really wanted to buy DHTMLX, but jqGrid is a half of price and works on unlimited projects, 50% of price for a penalization of 7% or 10% on performance, its ok for me, i will buy jqGrid. thanks again. Andrew, the price for dhtmlxGrid for unlimited products (including 1-year support and updates subscription) is $449, the same as for jqGrid. Not sure where you found the 50% price difference. Well, if you do NOT need the source code, support and updates, then you’re right. Otherwise, the price is higher. And if you have at least 2 developers in the team, the dhtmlxSuite license (includes support, updates, and source code for unlimited number of developers) is cheaper. let me know a customer that wants no pagination and I’ll send you my resume… I want work for him!! IT’S NOT THE REAL WORLD !!!! In all demos we used JSON datasource. Bucker, in which demo you have not found JSON data? JSON objects are used in all of them. Keep up the great work DHTMLx! I’m curious as to which is the fastest way to load a DHTMLx grid, json or xml? Brian, the JSON is a more compact format and weighs less so the grid populated with JSON data is loaded faster. Can you try with trend graphs chart and provide the results? how can draw a line chart with the help of dhtmlx grid. Sachin, you can use the dhtmlxChart library to generate line charts. It also can be linked to the grid data. Please check this sample and documentation. Non are valid arguments, non of the functionality offered by ExtJS 4.1 grid is available in dhtmlx grid. Not all functionality available in dhtmlxGrid is supported by ExtJs grid as well. Note that the above test compares the grids with similar settings. So without relations to grids’ feature set, the tested version of ExtJs grid shows quite a bad performance. Yea try exporting 500 records from IE9, grab a cup of coffee, a few doughnuts and flip to the sci-fi channel for a while. It would be nice if you can do ‘Loading Speed Tests’ against extjs 3.4.x and extjs 4.1.1a (stable versions). Extjs 4.0.7 cannot be considered as a production release, that is a big probelm with Sencha. Or you can post your test code here I can do the comparisons with extjs 3.4.x/4.1.1a. We are looking alternative for extjs 4.x.x because of the poor grid performance. I am using DHTML Grid standard version. 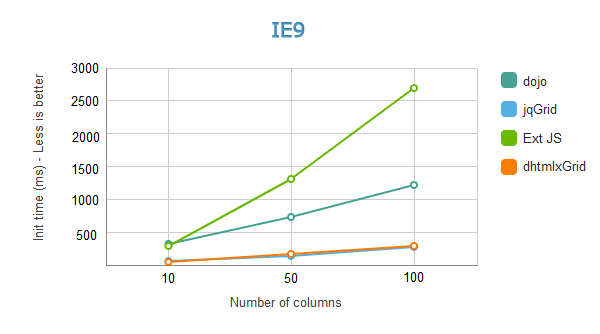 With IE8 it takes around 30,000 ms for 500 rows with 18 columns. Very poor performance in IE8. Wrong data presented here in this blog. Ashutosh, we have tested the grid demo (you can find the link in the article) in IE8. 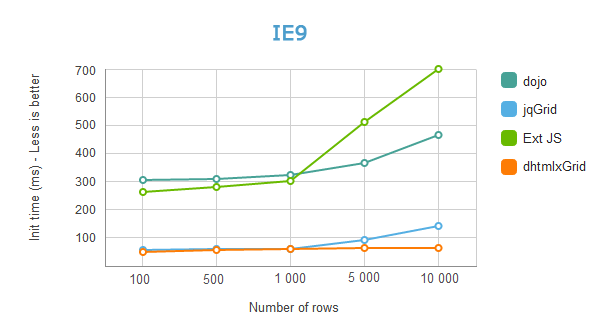 If you have performance issues with dhtmlxGrid in IE8, you can contact our team on the forum and provide your demo. Our technical team will help to solve this issue. Hi i would like to know that i can use dhtmlxGrid in my aspx page.